According to other local news sources, Hurricane Ida sent over 4 inches of rain to Atlanta yesterday. This record number quickly caused more flooding around town, even in the ATLflood HQ basement. 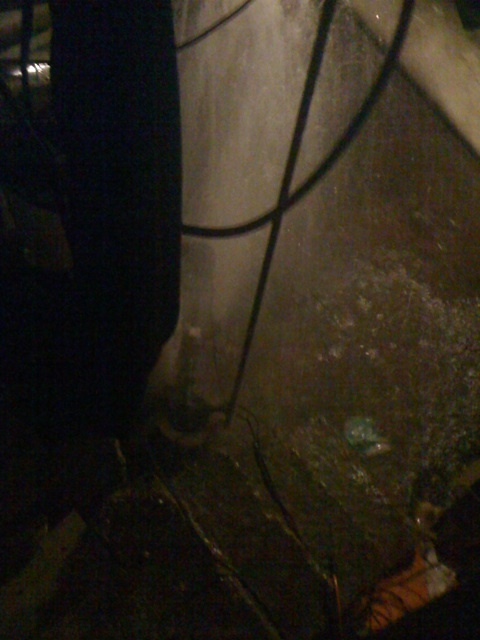 Apparently the storms were so severe that a small geyser erupted from beneath our house, sending massive amounts of water spraying up from the floor. We didn’t want to risk damaging our higher end photo equipment, but here’s a quick cell phone photo capturing the event. I was able to stop the flow of water earlier this morning but I’m somewhat concerned that I may have caught trench foot while wading through the swampy waters. This entry was posted on Wednesday, November 11th, 2009 at 12:54 pm and is filed under Uncategorized. You can follow any responses to this entry through the RSS 2.0 feed. You can leave a response, or trackback from your own site. hacer el regalo a ti mismo: flores para decorar tu casa.